The 1856 Flying Eagle Cent is the Key Date for the Series. Buy it Here. The Act of Feb 21, 1857, mandated that a smaller diameter cent made of copper-nickel be coined. The Large Cent, a staple in US coinage since 1793, had become too costly to mint. The first small cent was the Flying Eagle Cent, which was actually minted in 1856. The 1856 cent is technically described as a pattern coin, since the law establishing the new small cent was enacted in 1857. About 2000 of the 1856 Flying Eagle Cents were minted (the majority of which were proofs). 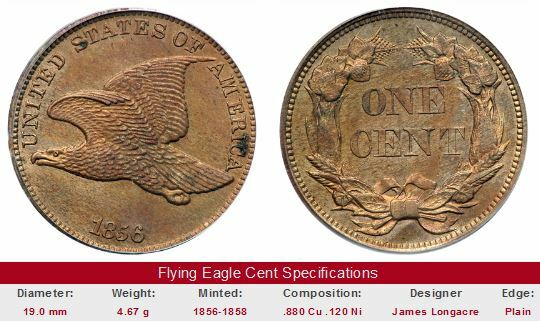 US Coin Values Advisor has completed Coin Value Tables for the Flying Eagle Cent, reporting price trends over a long period of time for individual coins of this series. On May 25, 1857, the US Philadelphia Mint began exchanging old large coppers and foreign silver for Flying Eagle cents. The program was very much a success. Near the exit door of the Cabinet, in a large glass case, is a magnificent American eagle, which is worthy of the visitor's attention. It is superbly mounted, with grand breadth of wing and wondrous piercing eyes. The portrait of this "pet" can be recognized on the reverse of the pattern silver dollars of 1836-1839 and on the obverse of the 1856 flying eagle cent. Peter is the name which the noble bird is recognized. He was an inhabitant of the Mint for six years. He would fly about the city, but no one interfered with the going or the coming of the "Mint bird" and he never failed to return home from his daily exercise before the time for closing the building. In an evil hour he unfortunately perched upon a large flywheel, and getting caught in the machinery received a fatal injury to his wing, and this ended rather an unusual career for an eagle. 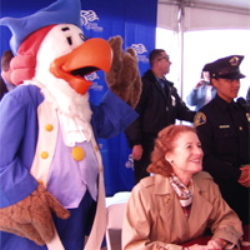 Peter the Mint Eagle waits in the wings beside U.S. Mint Director Henrietta Holsman Fore at the rollout ceremony for the California state quarter in 2005. Today, Peter has become a mascot of sorts for the Mint, portrayed as a cartoon narrator in educational outreach programs geared for young people. It seems as long as there is the US Mint, Peter's memory will be preserved. The Flying Eagle Cent was minted only through 1858. Insufficient metal flow into a few design element recesses (e.g. the eagle's head) while striking led Mint officials to abandon the coin. By the time this decision was made, more than 42 million Flying Eagle Cents had entered the channels of American commerce. The following year, 1859, saw the first of 50 years of production for the Indian Head cent. All Flying Eagle Cents are handsome additions to any collection, but the 1856 really is the only key date for the series. Many fakes of this rarity exist. A good way to avoid getting hurt is to only purchase an 1856 Flying Eagle Cent that is certified by PCGS, NGC, ANACS, or IGC. Most eBay coin auctions involving the 1856 Flying Eagle Cent are for self-described replicas of the famous coin. Primarily, these are curiosities and have no numismatic value to speak of. Once in a while, the real deal will make an appearance. The left hand side of the "Sales Box" is value trend data over a very long period of time for an 1856 Flying Eagle cent in Good-4 condition. The percent annual increase is computed for comparative purposes. The coin pictured for sale in the right hand side is not necessarily a G-4 example of the 1856 Flying Eagle cent.